On my Bally Wizard!, the center standup target awards 3,000 points and advances the bonus when it is lit, as it's supposed to. But when it is not lit, most of the time, it does advance the bonus but does not score the 300 points it should. Where should I look? Check this switch on the Lite Center Target relay. This being a Bally, I would check the score motor sw. there as well. Found that M&B switch on the Lite Center Target relay, it was adjusted properly. I've found that the Lite Center Target relay doesn't energize at all, ever. But when I activate it manually, the 300 point center light comes on. The Center Target relay is adjusted properly as well. Also, the two lower pop bumpers which share both common and hot wires, do not light ever. But the upper pop which has a different common, stays on all the time. All three are supposed to give 10 points, and then 100 points when lit. 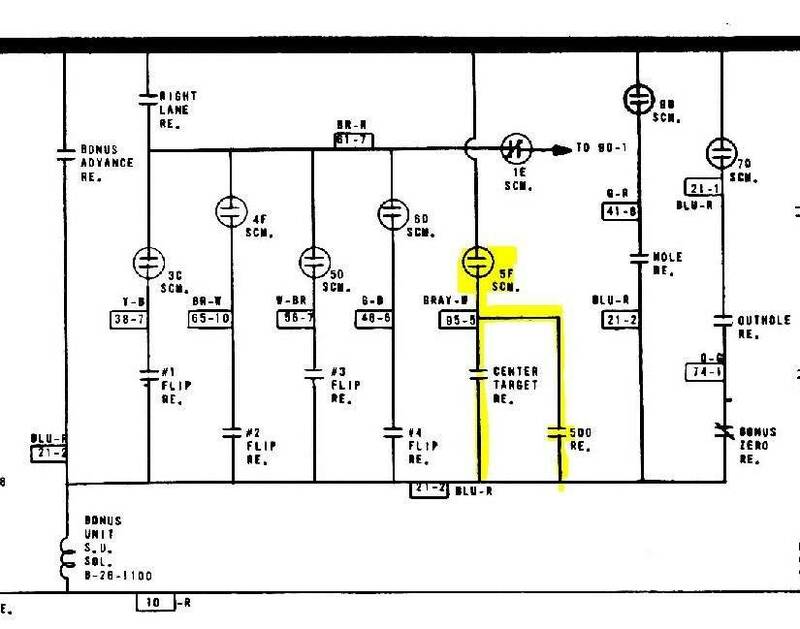 I found the schematic on the IPDB, but it's tough to read and therefore impossible to know which switch to check on the score motor. Found that M&amp;B switch on the Lite Center Target relay, it was adjusted properly. I've found that the Lite Center Target relay doesn't energize at all, ever. But when I activate it manually, the 300 point center light comes on. The Center Target relay is adjusted properly as well. On the schematics above from HowardR, Lite Center Target is on Score Motor 9A. Top bumper is always on. The bottom two light through bonus flag #1. You'll want to check both Flip Relay #1 and Lite Bumper relay (all the way in the back on the left hand side). 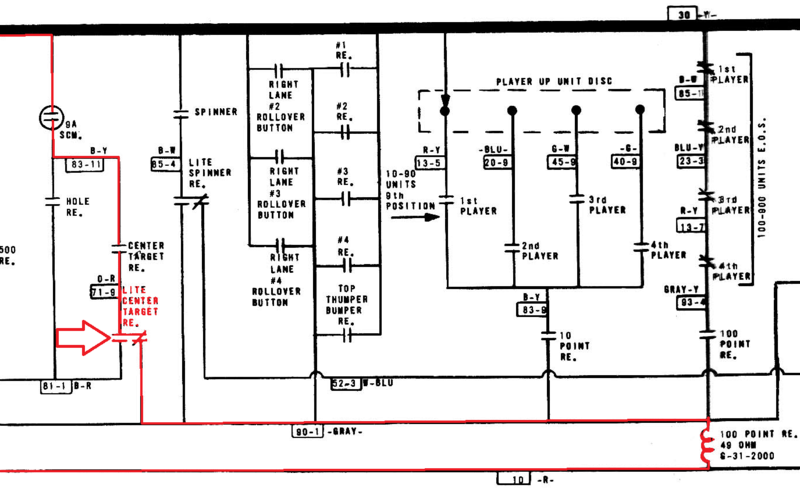 I think Bally schematics are the easiest ones to read. Anyway for the score motor switch notice how it says 5f? That means it's the 5th cam from the physical motor itself. F usually means the 6th switch from the bottom of the stack where A is first (lowest), B is the second Etc. All of that said it's very easy to follow the wire color code on the schematic. That's the Little Numbers in the Little Boxes by each wire there is a table that shows what each number represents as far as wire colors go. There is also a table of score motor cams usually on the side of the cabinet or on the schematic.